Meet the Grand Prize Winner of the Halloo Contest! What does your company do when a customer doesn’t want to leave a message? Losing potential touch points with customers can come with a high cost. By using features included in a cloud phone system, you can overcome some of the barriers keeping you from communicating with your customers. According to recent studies, nearly 4 out of 5 people calling into a small business who get voice mail do not leave a message. And it’s likely that this trend will only increase in the era of text and instant messaging features built into smart-phones. Q: I’m trying to get that record audio thing to work and call me but it is not working. Can you check it and let me know if I’m doing something wrong? A: You need to set up your forwarding numbers first so that the system knows where to call you. Sign in to My.Halloo.Com, and click on “User Settings”. Then click the “Forwarding” tab to set up your phone numbers. Enter at least one number here and click “Save Changes”. Next click “Voicemail” and then “Record”. You will now see your new forwarding number(s) displayed in the “Location” menu. How long are sales leads good for? 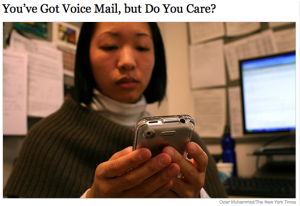 Study shows that if you get a customer voicemail, you better call them back – fast.